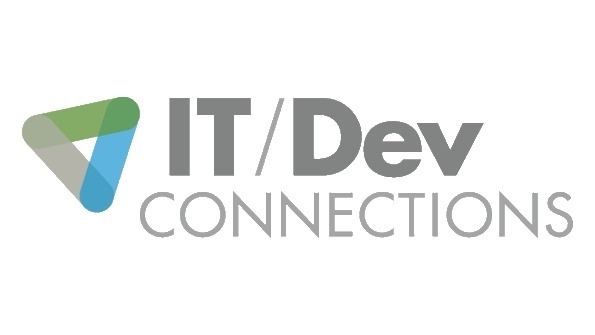 Fashionably late but just a quick blog post to say I am really excited to be back in Las Vegas for IT/Dev Connections for the third year in a row. For the pre-conference workshop I will be teaming up with fellow MVP’s Peter Daalmans and Kenny Buntinx. The breakout sessions I will be delivering with Kenny as well. If you are attending make sure to stop by one of our sessions and say hi! Tomorrow I will be presenting at ITPROCeed, Belgium’s biggest ITPro Conference. 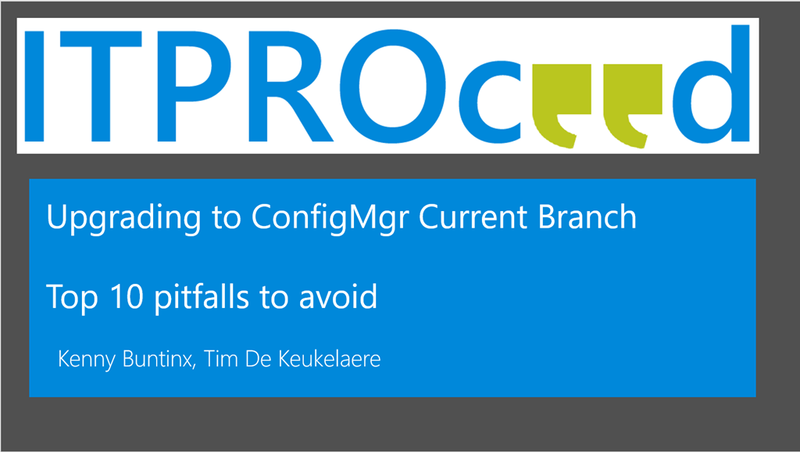 Together with my partner in crime Kenny Buntinx I will be outlining a few pitfalls to avoid when upgrading to Configuration Manager current branch. During this session we will bring our little black book with notes from the field. After this session you should be able to steer away from the troubles we have encountered during various upgrades. 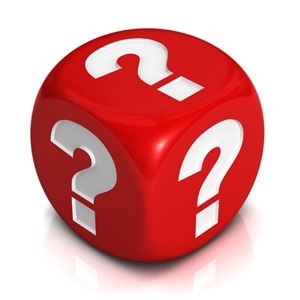 There will be time for your specific upgrade questions during the Q&A at the end of the session or you can simply talk to us at the event – we will be around for the entire day so do not be afraid to reach out! Interested? It is not too late to register! Tomorrow I will be presenting at the ECM CDM Day, a full day event organized by the System Center User Group Belgium. I will be on stage early in the morning delivering a session with my fellow SCUG members Kim Oppalfens and Kenny Buntinx. 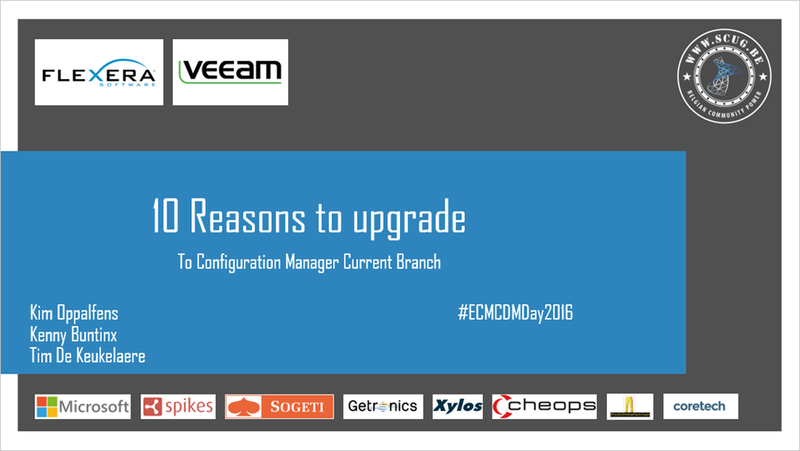 Our session will be an overview session with a few –very good- reasons to consider upgrading to Configuration Manager Current Branch. After this session there is plenty of more deep dive content and a unique opportunity to see two Microsoft Product Group Members: Jason Githens and Aaron Czechowski. They will be presenting a few sessions during the day. Last but not least we have another SCUG MVP on stage: Nico Sienaert. He will wrap up the ECM track before the networking drink starts. More details on the event can be found on the SCUG events page. Important: Registration will close any time now so if you’d like to join us please act fast! Tomorrow I will be presenting at a community event hosted by the Windows Management User Group (WMUG) in the Netherlands. 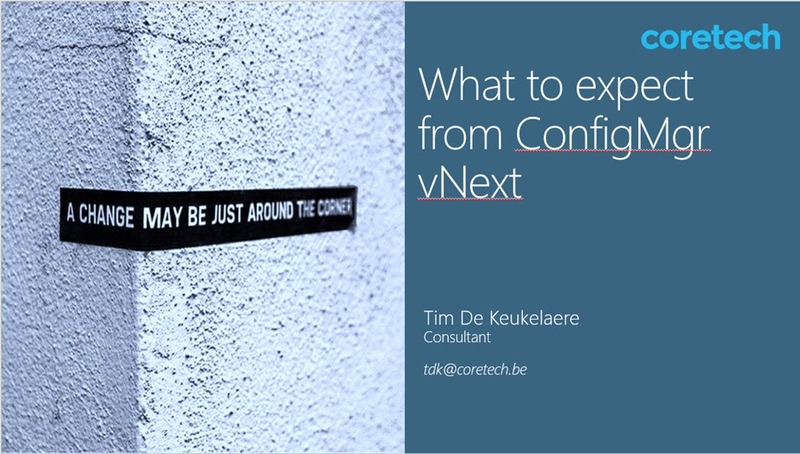 Session: What to expect from ConfigMgr vNext? Abstract : The next version of Configuration Manager is soon to be released. In this session we will look at the future roadmap of Configuration Manager and explore the new features, enhancements and infrastructure changes that are coming with the next release. Additionally will also outline how to get to this release from your current environments. More information on the sessions and the full event agenda can be found here. Registrations are currently still open. Click here if you want to attend! Update 30/11 : Session recording is available here. And also on Channel 9 here. Earlier this week I blogged about my stay in the US and my attendance at the MVP Global Summit during the first week. The week after the MVP Summit I have spent in Minneapolis attending the second edition of MMS – a three day conference organized by the Minnesota System Center User Group. Like last year the event took place at the Radisson Blu hotel located next to the Mall of America. For this second edition the organizers held on to the winning formula of last year: lots of deep technical content, great sessions with extended Q&A, and a lot of opportunity to interact with speakers during or after the sessions. Add to that a nice list of Microsoft speakers and the 2015 edition was bound to be a success. At the event I have attended quite some top notch sessions on a wide variety of topics. Next to technical content there is also a lot of show and entertainment: top sessions in that category kitagrie remain the Configuration Manager State of the Union session and off course the Jeopardy Quiz. As a speaker I have teamed up with Dieter Wijckmans for a session on combining the forces of Configuration Manager with Operations Manager. Next to that I was part of the panel at the EMS Ask the Experts session on Wednesday afternoon and earlier that day I did a BOF session together with Jeff Gilbert. 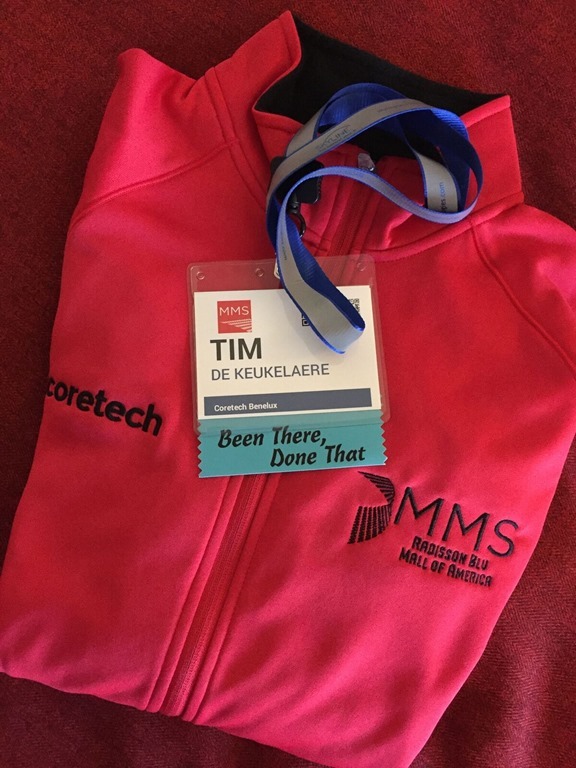 As a board member of the System Center User Group in Belgium I also participated in the MMS At Home session – which typically is the final session that wraps-up the conference. Make sure to mark your calendars for the 17th, 18th and 19th of May for MMS 2016! Registrations are already open!